Let us consider all the characteristics we have seen camels. A special system that allows it to hold thirsty, enabling hump traveling without eating, the structure of the foot which kept him from sinking into the sand, translucent eyelids, eyelashes that protect the eyes from the sand, which features specially designed nasal anti sandstorm, the structure of the mouth, lips and teeth which allow them to eat thorns and desert plants, the digestive system that can digest almost any object, specifically a thick layer that protects the skin from burning hot sand, hair and skin surface is specially designed to protect it from heat and cold. 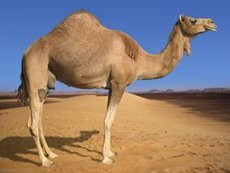 None of this can all be explained by the logic of the theory of evolution, and these states an obvious truth: The camel has been specially created by God to live in the desert, and to help human life in this place.